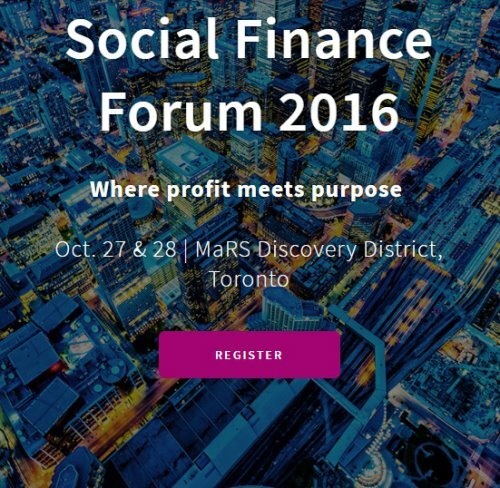 The Social Finance Forum is the leading event in Canada dedicated to impact investing and social enterprise. Organized by the MaRS Centre for Impact Investing, it is the largest gathering of social entrepreneurs, social finance professionals and impact investors in the country. It’s the place to make new connections, spot trends and get a glimpse of what’s coming next in this rapidly growing market. Social Finance is moving to the mainstream in Canada. Reflecting this growing profile, the 9th annual Forum will be our largest yet. Hear from more than 40 experts on where the social finance market is headed – and the challenges and opportunities that lie ahead. Explore the latest innovations, ideas and investment opportunities from Canada’s social ventures at pitch sessions and showcases. And connect with more than 400 like-minded professionals who believe in the power of business to shape a better future. Tailored, hands-on sessions take an in-depth look at a key consideration in social finance, such as how to define impact in investments or how to create an outcomes fund. These focused sessions provide real-world insights and advice. While detailed and specialized, they are designed to be accessible to newcomers to the field. Connect with the entrepreneurs reinventing how we tackle our social and environmental issues. Live pitch sessions and showcase booths give visitors a range of opportunities to hear the latest ideas from ventures working in fields such as clean technology, sustainable food, healthcare, education and affordable housing. Leading international figures in finance, government and business provide keynote talks at the Forum. These thought-provoking sessions provide insights into how leading institutions are responding to the rapid growth in social finance. It's time to take charge. We're turning over 12 sessions to participants to use however they wish. Present your great idea, run a workshop or do something completely different. Applications open soon. Explore the latest innovations from Canadian social ventures. Thirty for-profit, non-profit and co-operatives will demonstrate the products and services that are shaping brighter futures. Office Hours is the place for people interested in social finance to receive one-on-one advice from experts. Reservations open soon.